Erik Pevernagie: Since consumption is seen as a promising way to fulfillment and happiness, it has become an essential manner to impress the world around. Thus, financial status and outward appearance have become a required proof of self accomplishment and success. Sorry, insufficient funds, goodbye! 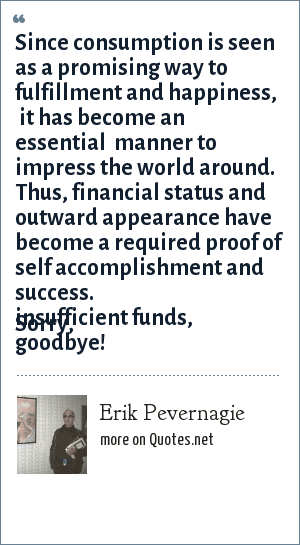 "Erik Pevernagie Quotes." Quotes.net. STANDS4 LLC, 2019. Web. 18 Apr. 2019. <https://www.quotes.net/quote/63550>.